GSSSB had Conducted an exam for recruiting candidates to fill in the vacancies for the post of Senior Clerk . A lot of candidates appeared for the exam conducted on 13-08-2017.The answer key for the same has been published and is available online. 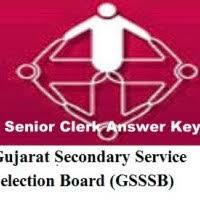 you can view answer key GSSSB Senior Clerk Exam Provisional Answer key 2017 from official website www.gsssb.gujarat.gov.in or below link. Candidates who have been appeared in exam will start searching for answer key. Answer key is not necessary but candidates want to check the status of exam. This information may helpful candidates to make career bright. Of candidates get score merit and find through answer key then they have to start the preparation for next selection process that is personal interview. So, download Gujarat SSSB Sr Clerk Answer key 2016 and check your marks. If you will find mistakes in answers key please send questions number to us, we will consider it and solve it. GSSSB Senior Clerk Exam Paper - Gujarat Subordinate Service Selection Board (GSSSB) has issued exam date notification, candidates who have already applied they need to download admit cards from its official site. Aspirants must and should check previous question papers, old/last year question papers/ exam papers for better preparation. Here I am sharing old Senior Clerk question papers for your best preparation. The exam date of GSSSB Senior Clerk is 13/08/2017.